A famous cyclist once said "It never gets easier, you just get faster." I thought about this as I lined up for my 35 Team Time Trial race for Baradene. I know myself, that no matter how many times I've done this event it definitely has not got easier. It was early Saturday afternoon and I was racing in the Baradene Senior A team I had been with throughout the season. 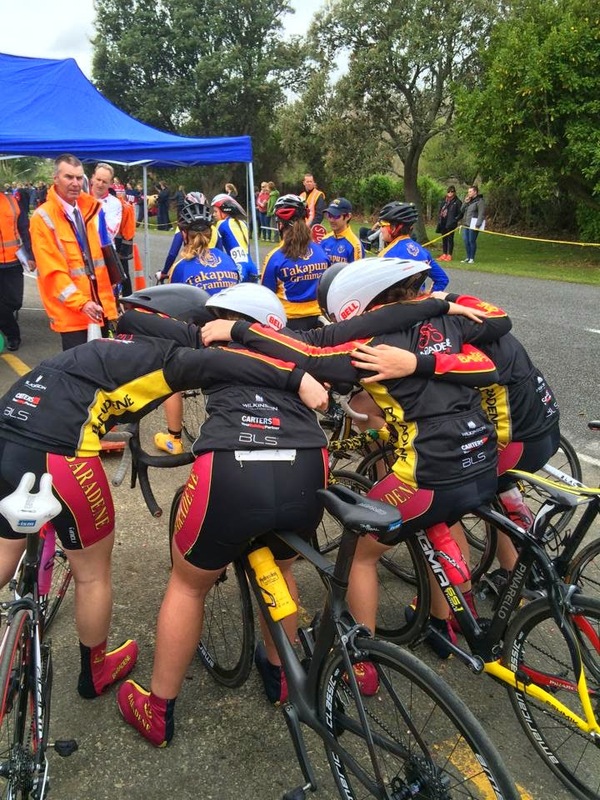 The race was over 16km of rolling hills in Levin, and the winners would be crowned National Champions. We lined up for the start, listening to final words of instruction and encouragement from coaches Tony Songhurst and Paul Leitch, and setting our eyes on the targets ahead. After 6km of battling the fierce crosswinds and hills, we reached the turn around, but disaster struck... Team member Maddy Songhurst snapped her chain coming out of the turn, we were forced down to 4 riders, gritting our teeth we pushed on further, faster, stronger. The remaining 10km was full of pain, swirling winds but defiantly no regret. We all collapsed after the finish line and we knew we left everything out there in the race. 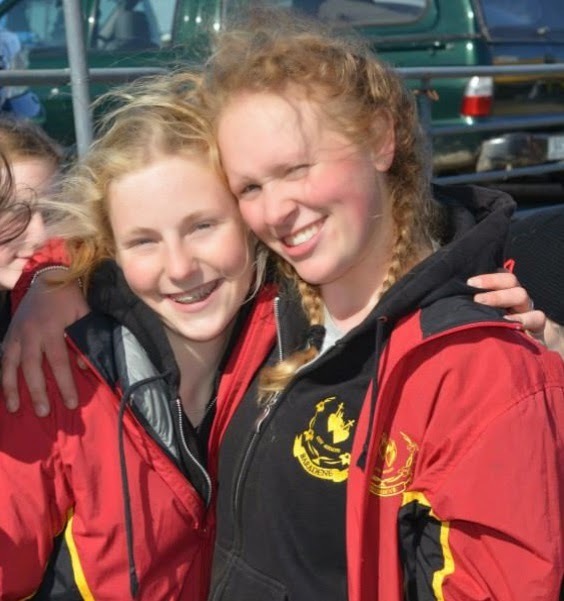 Once we returned back to our tent we received the exciting news that we had come 3rd!!! This was the first time a senior Baradene team had ever got on the podium at a national event and we were all extremely proud! We stood on the podium with huge smiles and it was a special moment for us all, reflecting the dedication and work we had put in over the season, what a way to sent our senior riders out on. The rain, hail and torrential winds welcomed us on Sunday to road race day. This was a new circuit with new challenges and I was absolutely pumped to race! But the extreme weather conditions were starting to look quite unsafe and many schools were looking at scratching their younger riders. 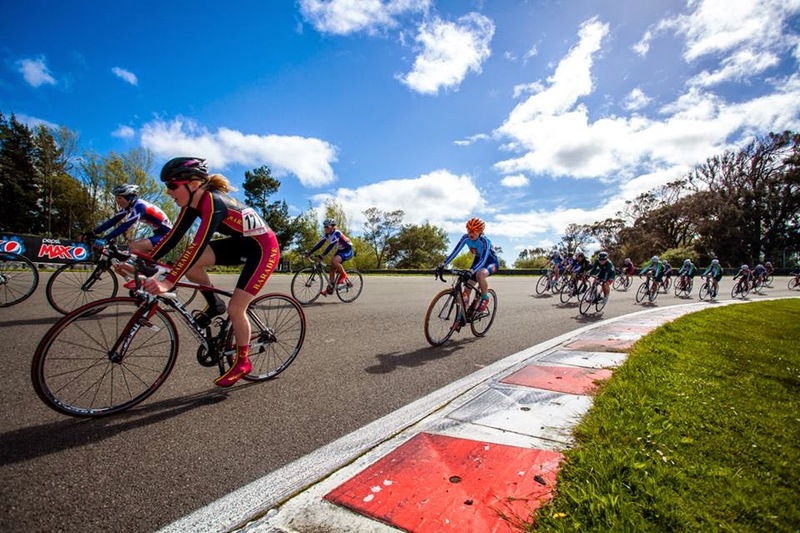 At about 10.30am and halfway through my warmup it was decided all u13, u14, and u15 grades would be cancelled for the day, so I would have to wait another year to race on this circuit! Later on it was announced all the racing for the day was cancelled, this was only the second time in the 40 year history of the event that a race has been cancelled. We decided to make the most of the day by going to watch a movie back in Palmerston North, and rested up for the big day that would follow. Criterium day started with a schools banner parade, the winner getting the corporate box and a free subway lunch! 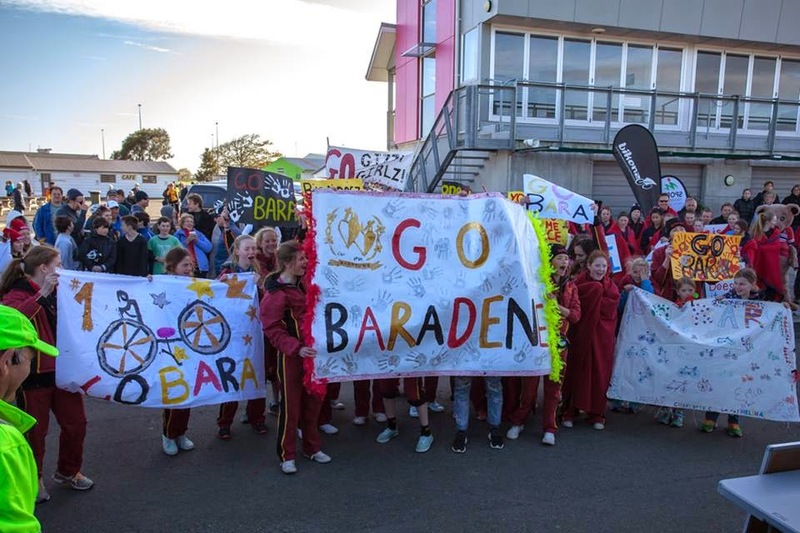 A combination of cool banners and loud chants got Baradene through to the top three, along with Waikato Dio, and Epsom Girls Grammar. Unfortunately we didn't pull off a win but we will defiantly be back next year to get it!! The crits. then started, first with the u13's where my brother Aidan won his first national title! The wind started blowing harder, and the sun shone hotter as the day went on, and my race was growing closer. Soon I found myself lined up at the start line, ready to race. We set out as a big pack, and the starting gun went off, 6 laps to go. The winner of the race is the rider who wins the most points, you can win points by placing in the top 4 riders across the line at the end of the three sprint laps. After our first sprint where I won 1 point, I knew I hadn't recovered fully from the virus I had weeks previously. I struggled for the rest of the race although I was doing all the right things technically. When the race finished I was disappointed, but soon realised that I shouldn't expect much because I still wasn't at 100% after illness, but 5th place nationally was a strong performance! The race offered a lot of learning for me and a very big opportunity to improve. I spent the rest of the day cheering on all the other Baradene girls and being with my friends. At the end of the day was the final prize giving, where the best boy and girl schools of the competition would be awarded with their respective trophies. 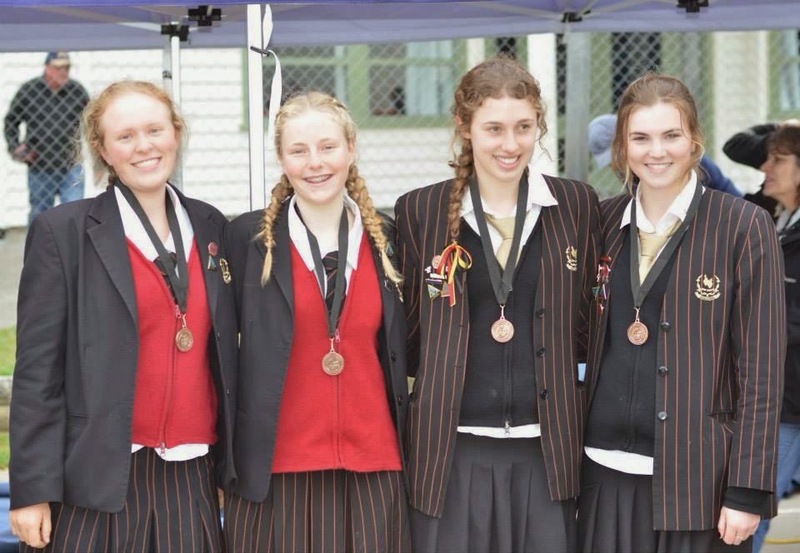 In every age group points are given to each of the top 10 finishers, the schools who have won the most points win the overall title. 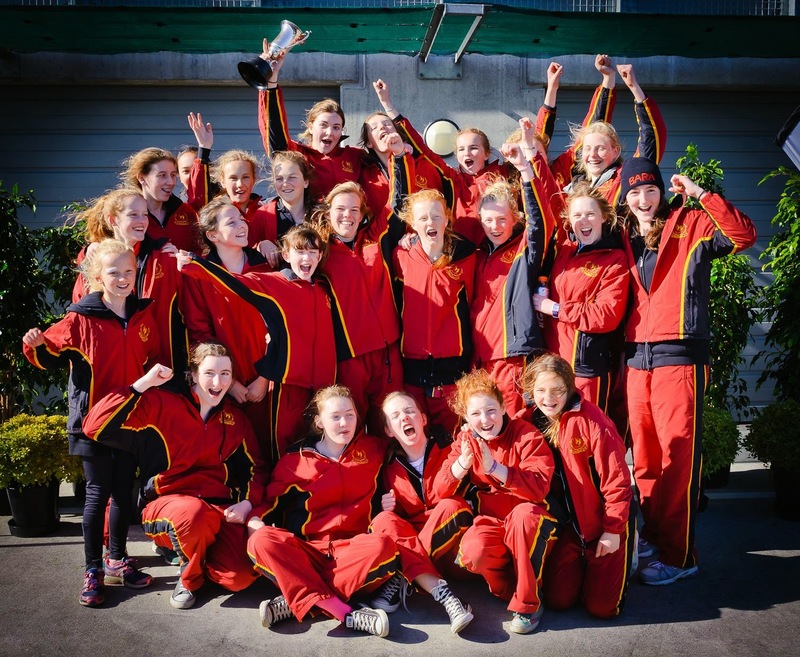 In the past two years the girl's school winner has been Baradene, and we were very keen to make it three years, what a way it would be to send our seniors off with this award, and way to end this year's road champs! Annnnd the winner of the AJ Drake cup, and the title of Best Girls Cycling School in the Country is....... BARADENE COLLEGE!! !